It must be a picture of a "group driving instruction class !" Or a photo of the street just minutes after the pub closed! This is the reason most towns started painting lines on the road. That might have been a parade? Notice all the people standing looking toward the cars. Herb -- thank you for posting it. I believe it is a staged photo. Note most of the cars appear full and are all facing the same direction. 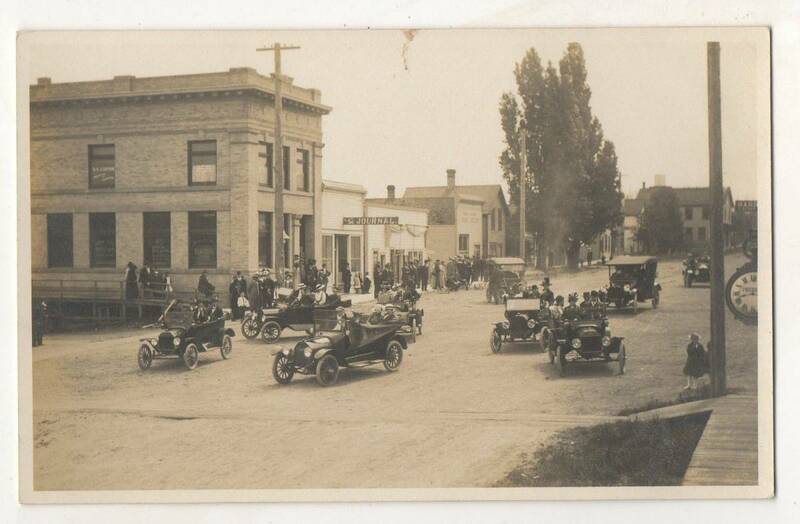 I do not recognize the other cars but I would guess the photo was taken around 1916 if that is in fact a 1916 Dodge. 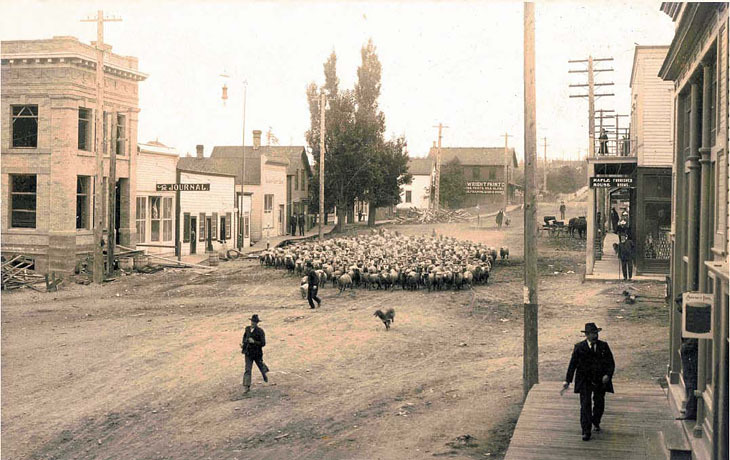 If it was taken 1917 or later I would think there would be a black radiator Ford in the photo. Kinda like my church getting out on Sunday! The car in back with a barrel front is probably a Franklin. From the small size, I'm guessing Model G, and several years old by the time the picture was taken. The clock to the far right is set to 8:20. I never noticed the trend in staged photos till someone mentioned it in another picture thread! I visited Friday Harbor a few months back. Nice town. I wouldn't mind living there, except I think I'd get bored. I even saw a house for sale that I liked! It's not all that different today when the ferry is unloading. Lots of cars all going the same way. The photo is taken looking east at the intersection of West and 1st Streets. The street that the cars are on heads southeast behind the cars. The streets in this old part of town do not run N-S and E-W.
With the Washington banner on the leading car and the time of day, maybe they are off on a road trip to the Husky game at the UofW. Here is a photo of just part of the building that is on the left of the original photo. At one point (early '20s if not before) it was said that half the cars in the world were Fords. On the presumption that this is is a random selection of cars, again we see that the proportion of Fords is high. The car that is front and center is a Studebaker. That's a sheep dog not a Studebaker! I've been trying to figure out the location for this photo. I've been to Friday Harbor many times, always by boat (4 times last summer alone). It's our major provisioning stop when in the area and before sailing north. Having spent hours walked those streets, and seeing that building many times, I couldn't reconcile 1st and West St with what I saw in the photos and my memory, so I got out my maps and looked at satellite photos, and have it figured out. That old bank building is now the Coldwell Banker real estate office and is on the corner of 1st and Spring St. The cars are on Spring street headed NE toward the water which is just a block ahead of them, pretty much toward the location of the photo that Terry posted. If they were to turn right at the intersection just in front of them, they would go to the staging area for the current ferry location. I've no idea where the ferry was back then, but it's most likely location would have been that same general area. Jim's suggestion that they may be a group off on a road trip would make sense as they are likely headed to the ferry and appear to have a send-off group watching. 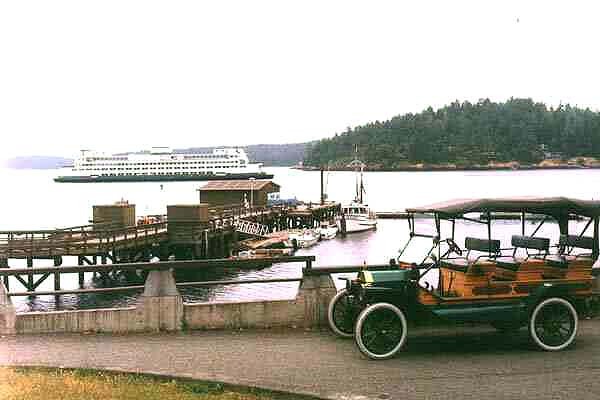 It may have been a pretty big deal back then for a group of cars to make the trip by ferry to Anacortes then on to wherever. The post card says "Main St", which makes sense because although the street is named "Spring St" it is very much the main street of town, and as far as I know, there isn't a street actually named "Main". 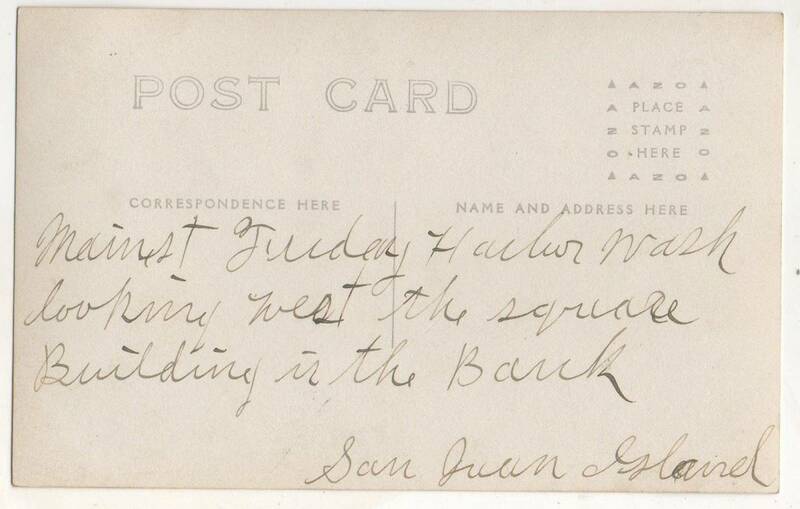 The Post card says "looking west". The camera angle is actually looking more south with the cars coming from the southwest. Thanks for posting those, Herb and Shawn. I'm going to print them and take them along next time to compare then and now. 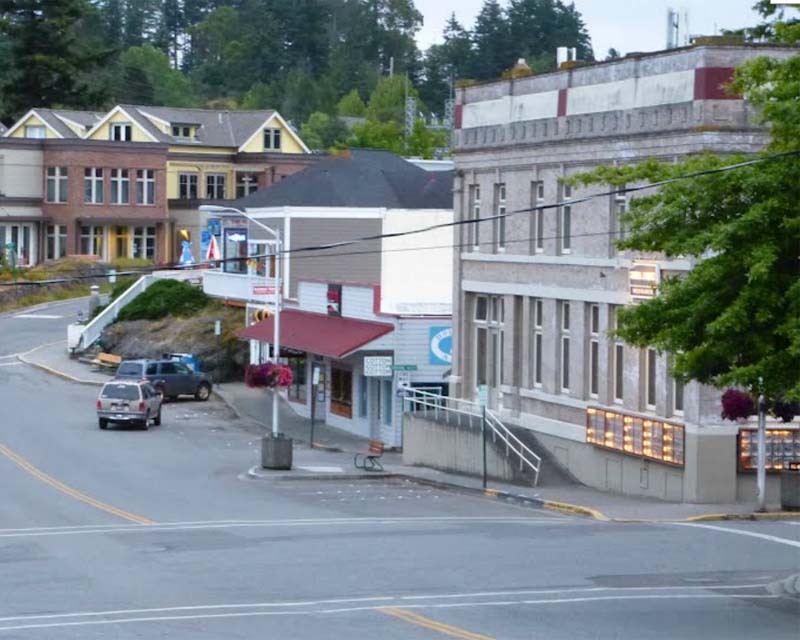 I think you are correct, I was kind of lost because there is no Google Street view in Friday Harbor and the photos that are there are miss-located. I don't think the clock is correct because the sun seems to be coming from the SW and that would not jive with 8:30 am or pm.